Many parasites accomplish a persistent infection by antigenic variation, like African trypanosomes which elude the host immune response by changing the Variant Surface Glycoprotein (VSG) coat. However, only one VSG is transcribed at the time, so that each trypanosome displays a single VSG type on the surface. Once active, the transcriptionis maintained epigenetically over many generations. Thus, VSG regulation represents a genuine example of mono-allelic expression. This arises the question of how a cell accomplishes the expression of only one VSG-ES out of many loci that share homologous sequences at the promoter region. Previously, it was proposed a model whereby the recruitment of a single VSG-ES telomeric locus to a discrete nuclear body (ESB) underlies the mechanism responsible for VSG mono-allelic expression (Navarro & Gull, Nature. 2001). The parasite life cycle alternates between the mammalian host and the tsetse fly vector. In the insect stage of the parasite no VSG is expressed, and an invariant glycoprotein named procyclin, covers its surface. Thus, in addition of the transcriptional switching regulation in the bloodstream form, VSG expression is developmentally down regulated in the insect stage.We favor a model whereby a coupled mechanism (Navarro & Cross, EMBO J. 1991) dependent on the recruitment of the VSG-ES to the ESB nuclear body (Navarro & Gull, Nature. 2001) operates for antigenic variation, whist a developmental transcriptional silencing for all the VSG-ES telomeric locifunctions in the insect stage (Landeira & Navarro, J. Cel. Biol. 2007). Our analysis of antigenic variation focuses on understanding the influence of chromosomal spatial repositioning on epigenetic transcriptional regulation. We accomplish this by using in vivo GFP tagging of chromosomes (see movie) together with functional analysis of genes by RNAi and high-resolution microscope for subcellular location of proteins in the nucleus. Whilst the active Variant Surface Glycoprotein-Expression Site(VSG-ES) telomereis localized to the ES nuclear Body (ESB) (Navarro and Gull, Nature (cover). 2001), inactive VSG-ESs and the constitutively expressed Procyclin locus are excluded, suggesting VSG-ES association with the single ESB is a distinct feature of mono-allelic expression (Landeira and Navarro, J. Cel. Biol.2007). Upon differentiation to the insect stage where no VSGs are expressed, the nuclear body ESB is no longer detected and the VSG-ES relocates to the nuclear envelope as silencing mechanism (Landeira and Navarro, J. Cel. Biol.2007). Functional analysis of the nuclear envelope protein NUP1 further reinforced the nuclear architecture model for VSG-ES regulation (Dubois et al., PLoS Biol.2012). Current results convincingly support the ES body/VSG-ES unique interaction model for mono-allelic expression, providing insights into the epigenetic inheritance mediated by nuclear architecture (Landeira et al., J. Cel. Biol.2009). We have found that the Cohesin complex is important in maintainingVSG-ES activity, as the knockdown of Cohesin led to the premature separation of the VSG-ES sister chromatids off the nuclear body ESB, triggering transcriptional switching (Landeira et al., J. Cel. Biol.2009). Altogether, our data support a model on how trypanosomes achieve developmental expression of surface proteins by nuclear repositioning mechanisms and antigenic switching by exchanging interaction with a unique nuclear body(reviewed in, Navarro et al., Trends in Microbiology. 2007). In searching for VSG-specific transcription factors, we found that in vivotranscription of the VSG by RNA pol I requires RPB7, a subunit/cofactor previously thought to be exclusive for RNA pol II transcription (Penate et al., EMBO Rep.2009). Most recently, we have identified a highly SUMOylated focus (HSF) as a novel nuclear assemblage that contained the nuclear body ESB and the VSG-ES locus. In addition, we showed that chromatin SUMOylation is a distinct feature of the active VSG-ES locus by ChIP experiments. SUMOylation of chromatin-associated proteins is required for the active transcriptional state of the VSG-ES and essential for efficient recruitment of RNA pol I to the VSG-ES promoter. The mechanism employs a SIZ/PIAS SUMO E3 ligase (identified as a TbRPB7-interacting protein) responsible for the VSG-ES chromatin SUMOylation.In contrast to the wealth of published literature focused on VSG silencing, our results indicate a positive mechanism via SUMOylation to regulate VSG transcription. Contrary to other eukaryotes, protein SUMOylation is linked to active gene expression in this protozoan parasite that diverged early in evolution(Lopez-Farfan et al., PLoS Pathogens. 2014). In addition of antigenic variation, the ongoing research topic in our group include the characterization of protein-kinase signaling pathways for VSG expression. We found that TOR kinase activity regulates RNA pol I activity, as TOR-depleted cells revealed a clear modification of nuclear RNA pol I localization(Barquilla et al., PNAS. 2008; Barquilla et al., PNAS. 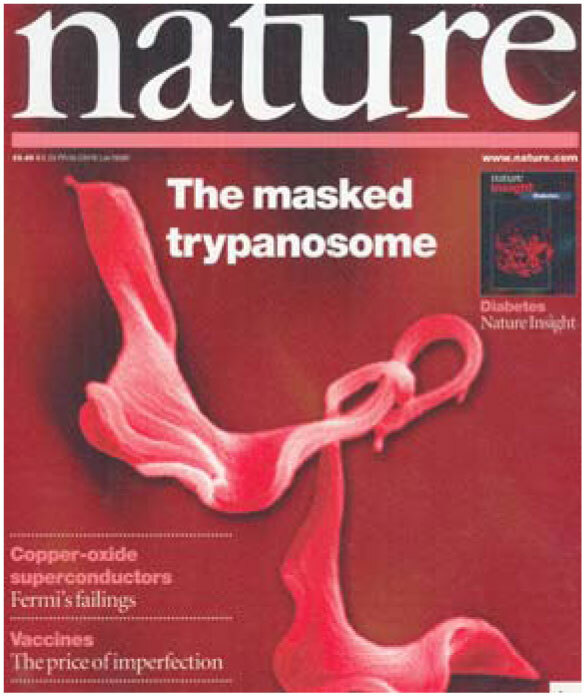 2012).Firstly, we have described the functions of the protein kinases family ¨Target Of Rapamycin¨ (TOR) in African trypanosomes. TOR kinase activities are essential in this parasite and are intimately linked to cell proliferation (Barquilla, et al., PNAS. 2008). Like other unicellular eukaryotes, Trypanosoma brucei contains two TOR kinases, TbTOR1 and TbTOR2, in two functionally and structurally distinct complexes TbTORC1 and TbTORC2 that controls cell growth and proliferation by conserved pathways (Barquilla & Navarro, Autophagy, 2009; Barquilla and Navarro, Cell Cycle. 2009). However, an additional TOR kinase is encoded in the T. brucei genome. TbTOR4 acts as a molecular switch that governs the bloodstream proliferative to the quiescent form differentiation process, serving as a regulator of the balance between cell proliferation and quiescence processes (Barquilla et al., PNAS. 2012), reviewed in (Saldivia et al., Bioch Soc Transactions2013). Barquilla, A., Crespo, J.L., and Navarro, M. (2008). Rapamycin inhibits trypanosome cell growth by preventing TOR complex 2 formation. Proceedings of the National Academy of Sciences of the United States of America 105, 14579-14584. Barquilla, A., and Navarro, M. (2009a). Trypanosome TOR as a major regulator of cell growth and autophagy. Autophagy 5, 256-258. Barquilla, A., and Navarro, M. (2009b). Trypanosome TOR complex 2 functions in cytokinesis. Cell Cycle 8, 697-699. Barquilla, A., Saldivia, M., Diaz, R., Bart, J.M., Vidal, I., Calvo, E., Hall, M.N., and Navarro, M. (2012). Third target of rapamycin complex negatively regulates development of quiescence in Trypanosoma brucei. Proceedings of the National Academy of Sciences of the United States of America 109, 14399-14404. Diana López-Farfán, J.-M.B., Domingo I. Rojas-Barros and , and Navarro, M. (2014). SUMOylation by the E3 ligase TbSIZ1/PIAS1 positively regulates VSG expression in Trypanosoma brucei. PLoS Pathogens. 2014. Diaz, R., Luengo-Arratta, S.A., Seixas, J.D., Amata, E., Devine, W., Cordon-Obras, C., Rojas-Barros, D.I., Jimenez, E., Ortega, F., Crouch, S., et al. (2014). Identification and Characterization of Hundreds of Potent and Selective Inhibitors of Trypanosoma brucei Growth from a Kinase-Targeted Library Screening Campaign. PLoS Neglected Tropical Diseases 8, e3253. Diaz-Gonzalez, R., Kuhlmann, F.M., Galan-Rodriguez, C., Madeira da Silva, L., Saldivia, M., Karver, C.E., Rodriguez, A., Beverley, S.M., Navarro, M., and Pollastri, M.P. (2011). The susceptibility of trypanosomatid pathogens to PI3/mTOR kinase inhibitors affords a new opportunity for drug repurposing. PLoS neglected tropical diseases 5, e1297. Dubois, K.N., Alsford, S., Holden, J.M., Buisson, J., Swiderski, M., Bart, J.M., Ratushny, A.V., Wan, Y., Bastin, P., Barry, J.D., et al. (2012). NUP-1 Is a Large Coiled-Coil Nucleoskeletal Protein in Trypanosomes with Lamin-Like Functions. PLoS Biology 10, e1001287. Landeira, D., Bart, J.M., Van Tyne, D., and Navarro, M. (2009). Cohesin regulates VSG monoallelic expression in trypanosomes. J Cell Biol 186, 243-254. Landeira, D., and Navarro, M. (2007). Nuclear repositioning of the VSG promoter during developmental silencing in Trypanosoma brucei. J Cell Biol 176, 133-139. Navarro, M., and Cross, G.A. (1996). DNA rearrangements associated with multiple consecutive directed antigenic switches in Trypanosoma brucei. Molecular and Cellular Biology 16, 3615-3625. Navarro, M., Cross, G.A., and Wirtz, E. (1999). Trypanosoma brucei variant surface glycoprotein regulation involves coupled activation/inactivation and chromatin remodeling of expression sites. EMBO J 18, 2265-2272. Navarro, M., and Gull, K. (2001). A pol I transcriptional body associated with VSG mono-allelic expression in Trypanosoma brucei. Nature 414, 759-763. Navarro, M., Penate, X., and Landeira, D. (2007). Nuclear architecture underlying gene expression in Trypanosoma brucei. Trends Microbiol 15, 263-270. Penate, X., Lopez-Farfan, D., Landeira, D., Wentland, A., Vidal, I., and Navarro, M. (2009). RNA pol II subunit RPB7 is required for RNA pol I-mediated transcription in Trypanosoma brucei. EMBO Reports 10, 252-257. Saldivia, M., Barquilla, A., Bart, J.M., Diaz-Gonzalez, R., Hall, M.N., and Navarro, M. (2013). Target of rapamycin (TOR) kinase in Trypanosoma brucei: an extended family. Biochemical Society transactions 41, 934-938. Seixas, J.D., Luengo-Arratta, S.A., Diaz, R., Saldivia, M., Rojas-Barros, D.I., Manzano, P., Gonzalez, S., Berlanga, M., Smith, T.K., Navarro, M., et al. (2014). Establishment of a Structure-Activity Relationship of 1H-Imidazo[4,5-c]quinoline-Based Kinase Inhibitor NVP-BEZ235 as a Lead for African Sleeping Sickness. Journal of Medicinal Chemistry 57, 4834-4848. - Rede de investigación colaborativa en enfermedades tropicales RICET. PROYECTO, PN2016 - REDES TEMATICAS INV. COOPERATIVA, Ref: RD16/0027/0019, (2017 - 2021). - ANALISIS FUNCIONAL DE LA NUEVA RUTA DE SEÑALIZACION TOR4-AMPK QUE REGULA LA DIFERENCIACION DE FORMAS INFECTIVAS PROLIFERATIVAS A QUIESCENTES EN TRYPANOSOMA BRUCEI. PROYECTO, PN2015 - PROY I+D - S. E. G. C. - P. EXCELENCIA, Ref: SAF2015-71444-P, (2016 - 2018). - HIT - TO - LEAD DISCOVERY FOR SLEEPING SICKNESS VIA INDUSTRY. National Institutes of Health. USA. National Institute of Allergy and Infectious Diseases. R01AI114685. CONTRATO/CONVENIO, , Ref: 20157023, (2014 - 2019). - RED RETICS. RED FIS, , Ref: RD12/0018/0015, (2013 - 2017). - Nuevas rutas de señalización de la quinasa tor (target of rapamycin) en tripanosomas africanos.Novel Tor (target of rapamycin) kinase signaling pathways in african trypanosomes. PROYECTO, PN2012 - I.F.N.O.- BIOMEDICINA, Ref: SAF2012-40029, (2013 - 2015). - La quinasa TOR como diana terapéutica frente a enfermedades tropicales protozoarias.. PROYECTO, PROYEX-10, Ref: CTS-5841, (2011 - 2015).